Size: 5.6" x 2.8" x 1.3"
This Corvus Model 625 combines the housing of the scientific Corvus 500 calculator with the functionality of the Corvus 615. While the Corvus 615 sports a vacuum fluorescent display (VFD) manufactured by Itron, uses this Corvus 625 a light emitting diode (LED) display from Hewlett Packard. Fellow collectors: We noticed Corvus 615 calculators with both VFD and LED displays and even a Corvus 625 with a green VFD was recently reported. If you own either a Corvus 615 or 625 calculator, please drop us a line with its serial number and display technology. Thanks! 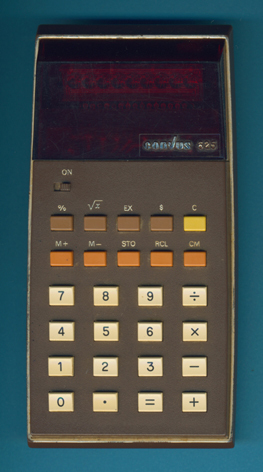 Other calculators sold under the Corvus brand are the 310, 320, 400, and 415 models. Don't miss the colorful Corvus 804. © Joerg Woerner, November 6, 2010. No reprints without written permission.